Thirty-four gigawatts (GW) of electrical generating capacity are now set to retire because of the Environmental Protection Agency’s (EPA) Mercury and Air Toxics Rule (colloquially called Utility MACT)[i] and the Cross State Air Pollution Rule (CSAPR)[ii] regulations. Most of these retirements will come from coal-fired power plants, shuttering nearly 10 percent of the U.S.’s coal-fired generating capacity. This report is an update of a report we issued in October 2011. [iii] Last October in the original report, we calculated that 28.3 GW of generating capacity would close as a result of EPA’s regulations. At the time, we warned that “this number will grow as plant operators continue to release their EPA compliance plans.” Unfortunately, this statement has proven to be true. This update, a mere four months later, shows that 33.8 GW of electrical generating capacity will close—a 5.5 GW increase. According to EPA, their modeling of Utility MACT and CSAPR indicates that these regulations will only shutter 9.5 GW of electricity generation capacity. But events in the real world already show that EPA’s modeling is a gross underestimate. To calculate the impact of EPA’s rules, we first assumed that EPA’s modeling of the regulation correctly predicted which power plants would close as a result of the regulations. Then, we looked at statements, filings, and announcements from electrical generators where the generators were closing power plants and in which they cited EPA’s regulations as the precipitating cause of the plant closures. We then compared EPA’s modeling outputs with the announcements and created a master list of plant closures as the result of EPA regulations (the master list is below). Combining actual announcements with EPA’s modeling shows that EPA’s modeling grossly underestimates the actual number of closures. 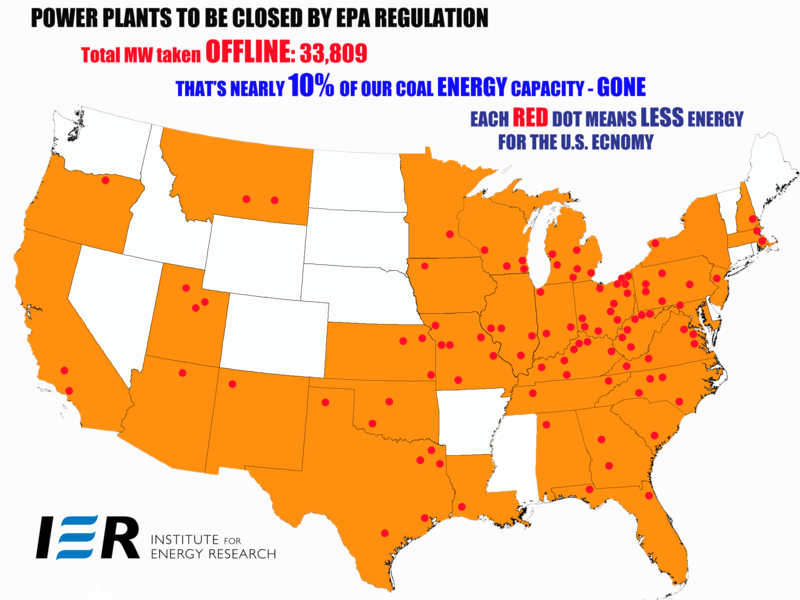 As noted above, EPA calculated that only 9.5 GW of electrical generating capacity would close as a result of its rules. But the reality is that nearly 34 GW of power generating capacity will close—over three times the amount predicted by EPA modeling. Worse, as utilities continue to assess how to comply with EPA’s finalized Utility MACT rule and CSAPR, there will likely be further plant closure announcements in the coming weeks and months. Operators in Georgia, Maryland, Michigan, New Mexico, Ohio, Pennsylvania, and Wisconsin have announced new closures since we first published our closure list four months ago. Additionally, operators in Minnesota announced they would cease plans to convert a coal plant to natural gas, letting the plant retire due to EPA regulations. [iv] In just six months, retirements related to EPA regulations have grown by 5 GW, more than the 4.7 GW of closures EPA predicted for the entire Utility MACT. It should be further noted that the North American Reliability Corporation’s (NERC) modeling of the MACT rule and CSAPR estimate that under the worst case, or “strict” scenarios, 16.3 GW of electricity capacity will be closed due to the regulations, and the Department of Energy’s (DOE) “stringent” test shows that only 21 GW of generating capacity will be closed. Even though NERC’s estimate is much lower than what our analysis shows, NERC is concerned that the closures will cause electricity reliability problems. [v] How much greater will the reliability problems be, given that retirements appear to be twice as great as NERC estimates? In public statements and the Utility MACT itself, EPA relies heavily on a DOE study claiming that even under a theoretical “stringent” test, EPA regulations would only close 21 GW of generation. 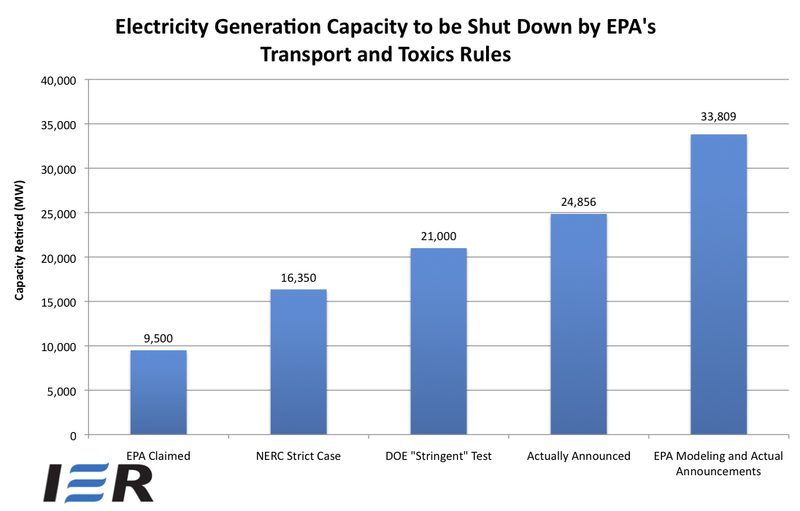 EPA has since claimed this study proves regulations will not threaten reliability. Our analysis, however, shows that between EPA projections and operator announcements, nearly 34 GW of generation will close—almost 13 GW more than DOE’s supposedly ultra-strict test scenario. The following is a list of all of the power plants that are set to close according to EPA’s modeling combined with public disclosures. A complete explanation of the methodology we used to compile this list is in the Appendix. Pricing trends in the PJM Interconnection are showing troubling signs concerning the impact on electricity rates of power-plant retirements due EPA regulations. EPA has called PJM Interconnection’s operating region “one of the largest and most heavily dependent on coal-fuel generation in the country.” Much of this coal generation is in an area PJM calls the “RTO,” which encompasses states like Ohio, Indiana and Illinois. Last May, PJM Interconnection held its Future Capacity Auction for 2014/2015, the first to incorporate Utility MACT requirements. During that Auction, future capacity prices in the RTO increased by an incredible 350 percent. PJM concluded the vast majority of this increase was due to requirements “to meet increasingly stringent environmental regulations.” According to the Chicago Tribune, these price increases will cause Chicago-area electricity bills to go up $107 to $178 per year and raise annual costs for Chicago Public Schools by $2.7 million, $3.3 million for the Metropolitan Water District, and $5.4 million for Chicago’s city government. Financial analysts now expect prices to increase even higher in northern Ohio due to recent power-plant closures caused by Utility MACT. UBS projects future capacity prices in this May’s Future Capacity Auction for 2015/2016 will increase at least 60 percent in northern Ohio. According to UBS, this increase is due to significant transmission congestion caused by recently announced Utility MACT-related power-plant closures. Deutsch Bank has said that prices could increase by as much as 300 percent. Ratepayers in northern Ohio are paying a high price for EPA’s regulatory agenda. [iii] Institute for Energy Research, IER Identifies Coal Fired Power Plants Likely to Close as Result of EPA Regulations, Oct. 7, 2011, http://www.instituteforenergyresearch.org/2011/10/07/ier-identifies-coal-fired-power-plants-likely-to-close-as-result-of-epa-regulations/. [iv] David Shaffer, Xcel’s power pullback, Star Tribune, Dec. 1. 2011, http://www.startribune.com/business/134825258.html. [v] See North American Electric Reliability Corp, 2011 Long-Term Reliability Assessment, Nov. 2011, http://www.nerc.com/files/2011LTRA_Final.pdf. [vii] See e.g. FirstEnergy, FirstEnergy, Citing Impact of Environmental Regulations, Will Retire Six Coal-Fired Power Plants (Press Release), Jan. 26, 2012, http://www.prnewswire.com/news-releases/firstenergy-citing-impact-of-environmental-regulations-will-retire-six-coal-fired-power-plants-138115263.html; Dow Jones Newswires, Midewest Generation, GenOn Energy Announce Power Plant Closings—WP, Feb. 29, 2012, http://www.foxbusiness.com/news/2012/02/29/midwest-generation-genon-energy-announce-power-plant-closings-wp/.